One-hundred and twenty Rio Grande City High School students were very lucky the morning of their incoming freshmen orientation this August because they received a free backpack with school supplies to begin their high school journey. In total, the school expects more than 540 freshmen to make up the class of 2016. Students, parents and school administrators anxiously waited for the orientation to begin, launching the start of a new chapter in the lives of the students. "I am looking forward to participating in softball, said Blessing Martinez, who is coming to RGC High from Ringgold Middle School. "It's going to be good to meet new people and prepare for college. I want to be a lawyer and high school is the foundation for that." "I am going to participate in football and ROTC," said Sebastian Ruiz, also rising to RGC High from Ringgold Middle SchooI. " I want to be a psychiatrist and I am going to concentrate on building my math skills and studying hard." The new freshmen were welcomed by the school cheer and drill teams with special performances, the presentation of colors by the JROTC, and a welcome by incoming sophomore Francisco Montalvo. "Set aside any fears you have," said Montalvo. "High school isn't a bad thing. it's a very positive experience. These will be the best years of your lives so enjoy it from day one." Attendees heard from Principal Adolfo Pena Jr. who revved the students up for the coming school year and taking on the task of excellence in academics and preparing for a college career in the future. "I am proud to welcome you to one of the best schools in the state, "Rattler Country'. I challenge you today freshmen to continue that tradition of working hard and being the best," Pena said. "You are our priority today and everyday. These are the first years of your careers, the first chance to explore your dreams through courses and activities. We are helping you shape the person you will become tomorrow. we are offering the best education possible, but it is up to you to take up the challenge." "This is a fresh start; what matters is today. It is the first day of the rest of your life," he continued. "We are about goals here and our goal is for you to go to college. And we won't take no for an answer. That is what your parents, that is what we and that is what the community wants for you." The activities for the orientation included information sessions about conduct, security, services, academics, and clubs and organizations. 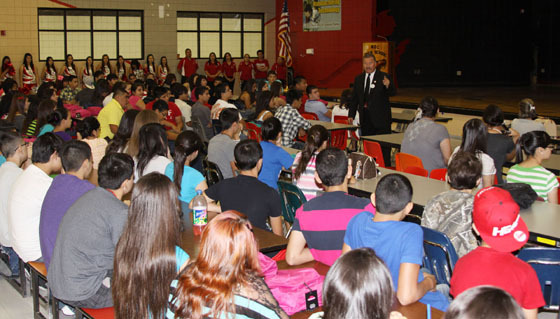 Rio Grande City High School principal Adolfo Pena addresses the new freshmen. Rio Grande City High School incoming freshmen learn about the expectations parents and administrators have of them.